Recording songs from online sources is the best way to enjoy your favorite tracks offline when you have weak Internet connection. Choosing an easy recorder songs software is very necessary for this. 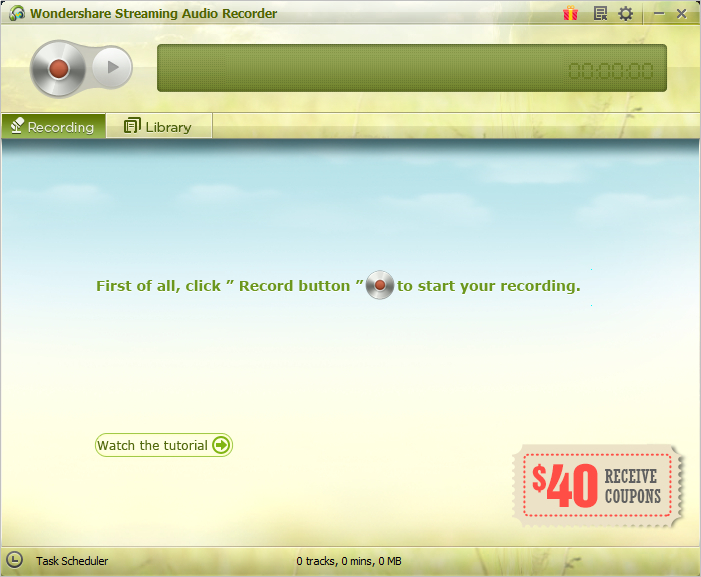 Easy Recorder will enable users to record songs from the online music sites, videos and other audio resources. But how to find an easy recorder songs seems difficult, as there are many recorders online that claim themselves as easy audio recorders. Therefore, this post will introduce the easy recorders for the people who want to record songs from the Internet. iMusic is in the list of easy recorder songs software mainly because this program provides a comparatively high quality of the recorded files. This program enables users to record music files from the online music and video sharing sites, TV shows, chatting software and more. This part will introduce the key features of this program, and how to use it to record songs from the online music sharing sites. iMusic is All-in-One Music Downloader and Management Tool. Download music from more than 300 music sites by copying and pasting the URL. Record unlimited music from any website for playback in your computer with just one click. 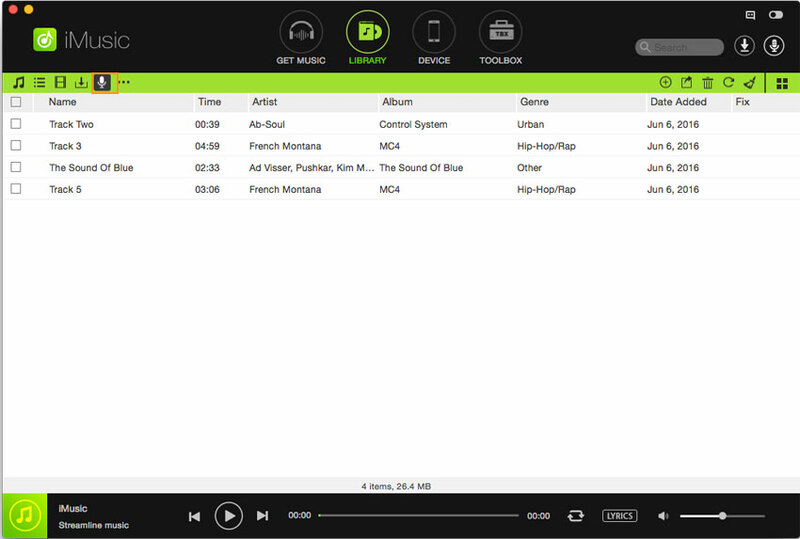 Built-in music library let you browse and preview the lattest and hottest music. Automatically save downloaded/recorded music to library for management and easy transfer. 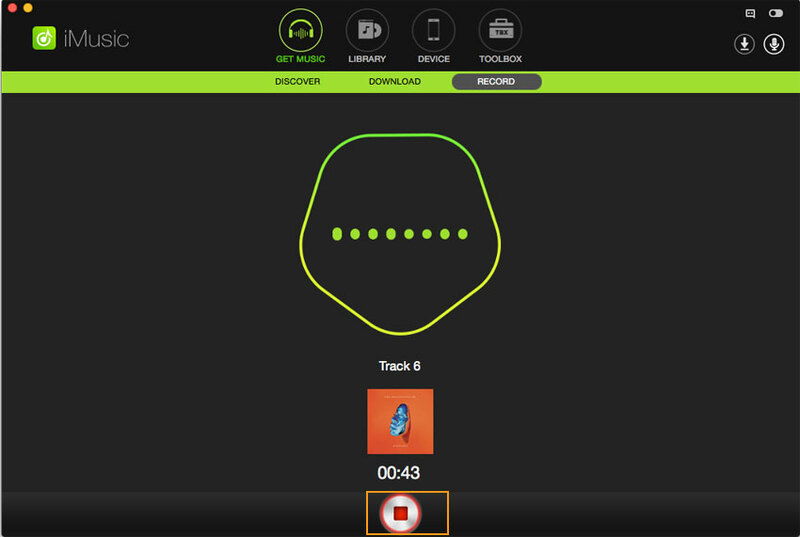 Identify and tag music with artist, title, album, genre, and more with the latest technology. 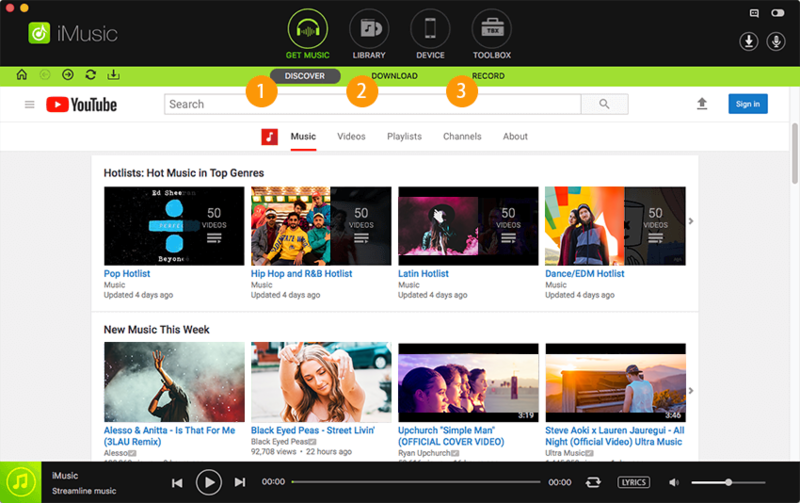 iMusic gives the user an access to record tracks from over 1000+ websites as well as many other popular playlists. The program will save the recorded music files in its music library, so that the users to get the music files they need easily. 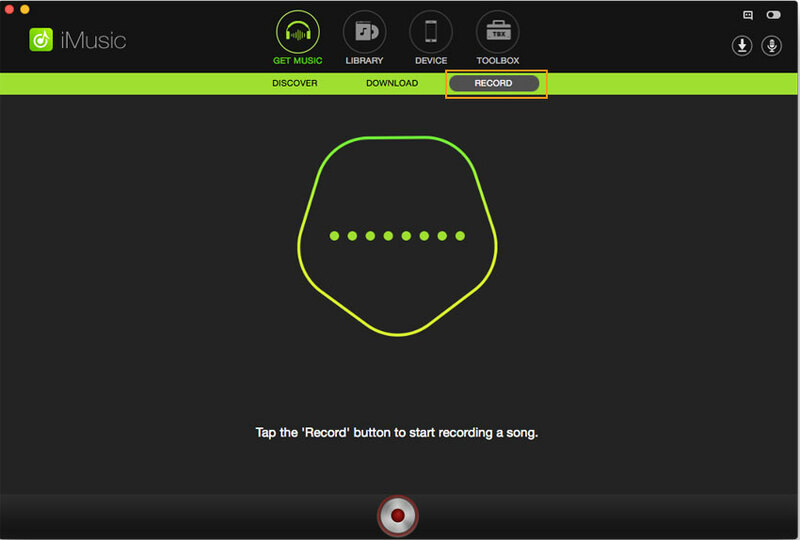 iMusic is an easy recorder songs software thanks to its user-friendly interface, and easy-to-follow steps for the users to record music. The program will automatically obtain ID3 tags during the recording process. iMusic allows users to record music without any loss of the audio quality. iMusic will save the recorded music files in MP3 files, which is supported by most of the operating systems. Step 1. Download and install iMusic on your computer, then start it. 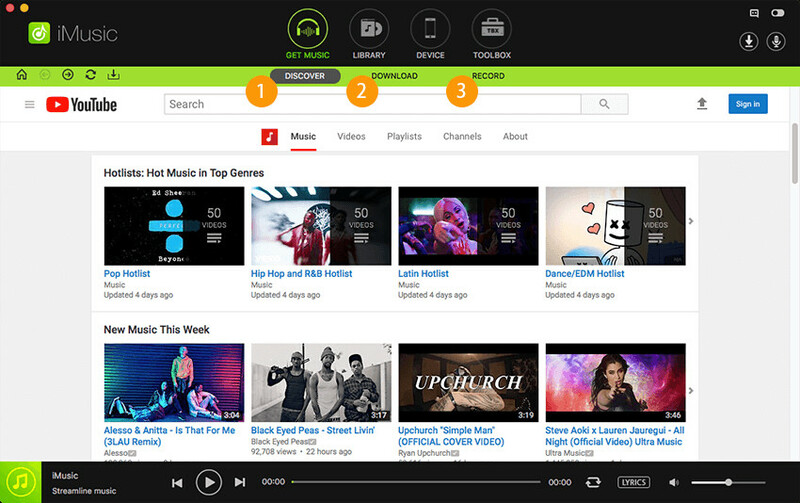 You'll see the main interface of discovering music. Step 2. Choose the RECORD option at the top middle of the software window, and then click the Record button at bottom to let the program stand by. Then you can start playing the music you need, and the program will automatically record the file. Note: Please note that you should click the Record button before playing the file you want to record, so that the program can record the audio file completely. Step 3. You can click the Record button again to finish the recording process. Then you can click the microphone icon at the upper right corner to locate the recorded audio files. Wondershare Streaming Audio Recorder is one of the best easy recorder songs programs because it allows the user to record songs from any audio or video files. As long as the audio file is playing, this easy recorder will record the audio file. With the help of this program, you are able to record audi files easily on your computer. This part will introduce the key features of this program, and how to use it to record audio. 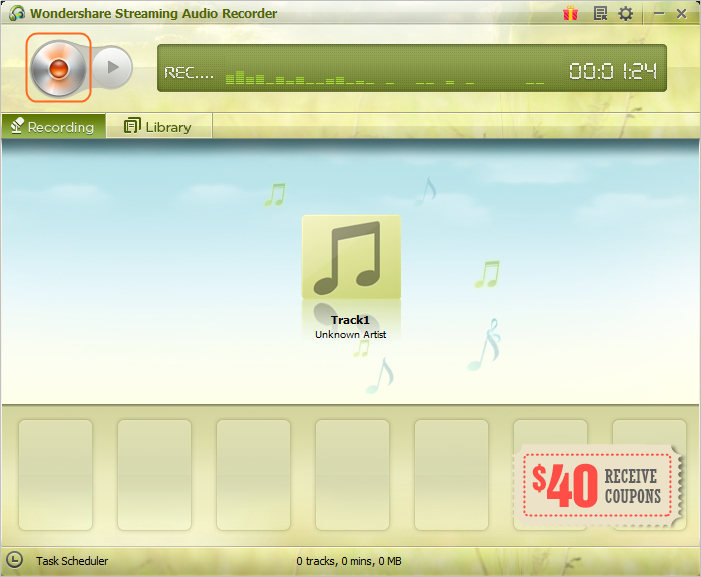 Wondershare Streaming Audio Recorder allows users to stream music as well as videos with no efforts. The program has an Advertisement Removal feature, and it helps to block the pop-up ads during the recording process. The recorded files can be saved in MP3 files, which is supported by most computer systems and mobile devices. This software also helps users to record audio files from the chatting software, like Skype. This software will keep high audio quality in the recorded files. This software allows users to record audio files from more than 1000 sites. There is a Make Ringtone feature in the software, which helps users to make their own ringtones from the recorded files. 1. I have a bunch of tracks where the name was screwed up. I just use this and it automatically pulls the info to correct the track name. Only thing I would like, is if you had the option to choose what format it saved your title. Currently mine just does song_artist. I would like to do artist_song, etc. Definitely worth the money, I would pay more for this program than they are charging. You can record music off of Spotify, and Pandora easily, and its pretty accurate on the song naming unless the artist is somewhat obscure you might run into some, but very little issues. 2. I had spent half a day looking for an audio streaming recorder and found nothing but frustration. Several programs contained malware and crashed my pc to boot...even from reputable sites. I am so happy I found this program. It does exactly what I need it to do and it WORKS. No settings, no timing. You just press record and it records all by itself. Didn't even read instructions. No malware, spyware, stupid toolbars. Can't beat that. Step 1. Download and start Wondershare Streaming Audio Recorder on your computer, and you'll see the main interface. Step 2. click the Record button at the upper left corner to make the program stand by, and then play the music files you need, and the program will automatically record the audio file. Note: Please note that the program won't get the complete music info if you play the audio file before clicking the record button. Step 3. You can click the Record button again to stop the recording process. The program will save the recorded music files in its music library. 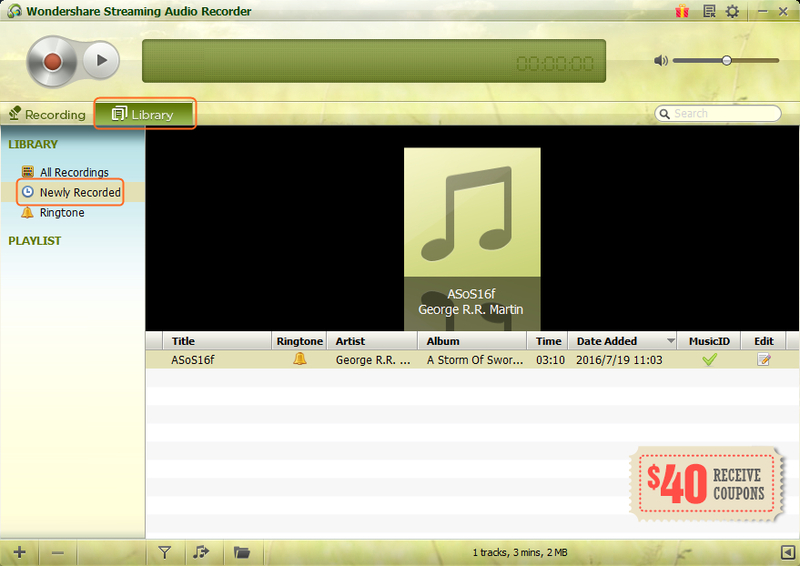 You can choose the Library option, and select the Newly Recorded playlist to view the recorded file. iMusic and Wondershare Streaming Audio Recorder are both helpful easy recorder songs programs. But still, many people are seeking for the online easy recorder songs solution. The following part will introduce one of the best option to you. OnlineVoiceRecorder.com is a great choice when it comes to the online easy recorders. The website provides an easy homepage, and makes the recording process very direct. This site allows users to record audio files with simple steps, and the following guide will show you how to use this online easy recorder songs program. Step 1. Go to the website, and you'll see several options in the menu bar. Choose the Voice Recorder option, and the program will show you the recording interface. Step 2. Click the Record button in the left sidebar, and play the music file you need. Then the online recorder will start recording the music files. You can click the Record button again to finish the recording process. Step 3. When the recording finishes, you'll see the Save button at the right side of the software window. You can click the Save button and choose a target folder on your computer to save the recorded file. Then you can save the recorded audio files to your local hard drive. Conclusion: iMusic, Wondershare Streaming Audio Recorder, and OnlineVoiceRecorder.com are all easy recorder songs programs. All of them can help you to record songs easily, but you can easily find out that iMusic provides more powerful features than the other two programs. So if you are interested in this program, just free download the program and have a try. Copyright © iMusic Studio. All Rights Reserved.